Have you noticed that we don’t spend much time on the Holy Spirit in the historical creeds of the church? The Holy Spirit gets one line in the Apostle’s Creed – “I believe in the Holy Spirit” and it doesn’t even make the Holy Spirit the subject who creates the communion of saints or the forgiveness of sins, and so on. The Nicene Creed gives us a little more, but it also does not detail the work of the Spirit, except to say that the Spirit spoke through the prophets. What about the Holy Spirit of Pentecost? What about this Spirit that comes in wind and fire, a Spirit that gives the disciples extraordinary and inhuman abilities to spread the good news of God’s love to a culturally and linguistically diverse community and world? Truth be told, the Holy Spirit makes us uncomfortable—the Spirit is a bit of a loose cannon. The Holy Spirit is not a part of God we can control or understand, or put in box and summarize in a creed. God the Father is the creator of heaven and earth. We can handle that. Jesus was God in human form. We’ve got Christmas and Easter and John 3:16, so we’ve got that figured out. But the Holy Spirit? The Spirit doesn’t lend itself to definitions; there’s no holiday we can create to put a structure around it. We never know when the Spirit is going to act or what it’s going to do. This is uncomfortable because we like structure and form, constitutions and institutions, mission statements and 5-year ministry plans, liturgies and hymn books, traditions and expectations, Bishops and synods, and well, the Spirit of Pentecost is just too wild and unpredictable! Who can control wind and fire? How do we put that in a creed and a constitution? At one of the congregations I formerly served, the Worship Team and I were trying some new things in worship—nothing too radical. The organist's husband brought in a drum set and played along on a few of the hymns. On Bread of Life Sunday, we started a bread machine in the sanctuary so we could smell the bread of Holy Communion as well as taste it. We put up a PowerPoint screen and showed images and pictures for the youth service. We tried to make worship more experiential rather than just cognitive, and wanted to give the Holy Spirit a few more openings to touch someone in a new way. One woman, I’ll call her Fran, came up to me after we started trying a few different things, and she said, “the minute you install screens up there, I’m outa here.” Well, we weren’t even close to doing that, but Fran was voicing an anxiety about whether she mattered. She was locked into thinking that there was only one way to worship that would feed her and that was it. Fran couldn’t imagine that the Holy Spirit could speak to her, or touch her or communicate good news to her in any way that was different from what she was used to. Well, you don’t need the Holy Spirit if you just do it the way we’ve always done it. Fran was right about one thing – things are bound to change when we open ourselves up to the Holy Spirit. And in that sense, the Holy Spirit is dangerous and uncomfortable. When we look closely at our Acts passage, we see why. After Jesus ascended into heaven, the disciples along with the women and many others who followed Jesus—about 120 people in all—were gathered in one place. They devoted themselves to prayer, and they picked Matthias to take Judas’ place among the 12 disciples. Jesus told them that they would “receive power when the Holy Spirit comes upon them and they will be witnesses in Jerusalem, all Judea and Samaria and to the ends of the earth.” They had been waiting about 9 days. They didn’t know when this power would come, they didn’t know how this power would come, and they didn’t know in what form this power would come. Would it come in a cloud, like in the book of Numbers? In a dove like at Jesus’ baptism? No one knew. Talk about feeling out of control! Jesus wasn’t even with them and there was no constitution, liturgy, plan, Roberts Rules, order of worship, or anything else they could look to in order to know what was coming next. All they had was each other, prayer, and Jesus’ promise that a power was coming. The Holy Spirit is an equal opportunity employer! The first radical act of the uncontainable, uncontrollable, uncomfortable Holy Spirit was to erase all divisions among those whom God calls to serve. It’s men and women, young and old, disciples and non-disciples, educated and uneducated, wealthy and poor, pastors and laypeople. Religious professionals like me, most definitely have not cornered the market on the Holy Spirit, and those who think the Holy Spirit would never work through you, think again! No wonder the Holy Spirit makes us uncomfortable—everybody gets the Holy Spirit—even people I don’t like, or who I think are undeserving. Perhaps even more startling is the fact that if the Holy Spirit works through anyone and everyone—and that also means you. The second radical act of the uncontainable, uncontrollable, uncomfortable Holy Spirit was to speak the language of every single ethnicity present. “Parthians, Medes, Elamites, and residents of Mesopotamia, Judea and Cappadocia, Pontus and Asia, Phrygia and Pamphylia…” and all those other names you hope you don’t have to pronounce as the Reader on Sunday morning! The Holy Spirit makes the good news of God’s love culturally relevant—people hear the good news of God’s love in their own native language. We may not have Parthians and Medes in Florissant, but do have Millennials—those born between 1983-2003; we do have the largest population of Bosnians in St. Louis outside of Bosnia; we do have the “spiritual but not religious;” we do have young people who wonder if their lives matter—so, Atonement, what does it mean for us to share God’s mighty deeds of power in their native language? How might the Holy Spirit be working through you to communicate God’s love to those who are outside the church? The Apostle Paul struggled with this very question as he preached the Gospel across the Mediterranean world, which is why in 1 Corinthians 9:22 he says, “I have become all things to all people, that I might by all means save some.” He worked to share God's love in culturally relevent ways to reach everyone he possibly could. That’s what I like to say to the Fran’s of the church who are afraid of too much change and who fear that they don’t matter. You matter more than you can ever realize! The Holy Spirit can speak to you in such a rich variety of ways, and more importantly, the Spirit is using you in this congregation and in the community to touch and help someone else. The Spirit’s wind and fire is on you and working through you, and that’s much bigger than whether I got exactly what I wanted out of one worship service or church event. In fact, many church gurus believe that the 21st century is more like the 1st century than any other time in our history. The 21st century is a Pentecostal century where we have to rely on the power of the Holy Spirit to reach people with God's love. Does waiting for and watching for and working with this uncontrollable, uncontainable, uncomfortable Holy Spirit mean that our church structures and institutions, traditions and practices don’t matter or are unnecessary? Of course not. There is so much mission we can do as the church including feeding the hungry, preventing malaria, digging wells, disaster relief, educating children, taking care of seniors, and on and on because we are an institution and work together as the body of Christ. The uncontrollable, uncontainable power of the Holy Spirit is breaking open God’s future here at Atonement and the Spirit is using you to do it! We have each other, we have prayer, and we have the power of the Spirit who comes in breath, in wind and in fire, and that’s all we need to fulfill God’s future in this place and to the ends of the earth. 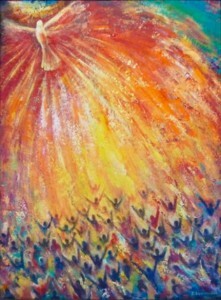 Image: Art by Veronica Dimae, Australia, "Pentecost," 2010. Media acrylic on stretched canvas, 130 x 100 cm. Found via http://www.iccrs.org/en/pentecost-in-art/.